Microsoft Office was designed from the ground up as a powerful productivity platform for numerous PC-related tasks and jobs, and has gained massive popularity over the years, becoming the leading solution on the market. However, making it a truly all-purpose tool, able to perform in practically every scenario that the modern workplace produces, is no small task. To counter this limitation, Microsoft has included the possibility for independent developers to create their own functions into the platform, without compromising its integrity or copyright licenses, by introducing the MAPI (Messaging Application Programming Interface) protocol – a sort of “bridge” for anyone to use between the closed architecture of Office and supplemental software written in popular programming languages in order to include a desired feature. This protocol has allowed many to produce their own long-sought productivity improvements that Microsoft had or has no desire to implement owing to small margins – the main features of Office require many man-hours to maintain as it is. Consequently, an impressive number of such software products have appeared on the Internet over the years as the result. Today we would like to talk about one of these many add-ins – this one is of our own making – whose function is to send email automatically, with no user required to be present at the computer (it would be appropriate to note here that a solid majority of such supplementary Office software (or “add-ins”, as we at MAPILab call them) are aimed essentially at automating existing work processes. The add-in in question is purposed to auto-send email in Outlook, automating the routine of manually sending recipients a file which has been updated recently: a price, a periodic report, or a list of some kind – these items naturally undergo changes from time to time, while remaining structurally unmodified. 1) Check whether the file really exists. 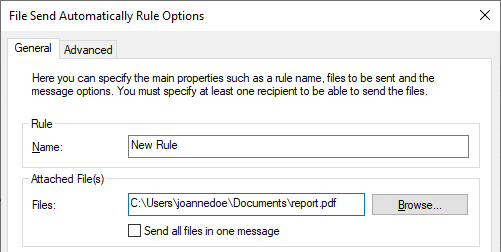 2) Create a new letter intended for a recipient (or a group of recipients) of the updated file, or to modify a previous one to accommodate the updated file. 3) Manually attach the file to the new letter, including having to point to its location across storage manually. 4) Send the letter at the specified time, possibly double-checking it prior to clicking the “Send” button to remove the possibility of human error. If the file is updated even weekly, the repetition of following each of these steps equates to a significant load for the person tasked with this job. This is where the File Send Automatically comes into play. The File Send Automatically is a component in the collection of add-ins called the MAPILab Toolbox – it comprises 18 handy little tools which are created for this and similar time-saving purposes. 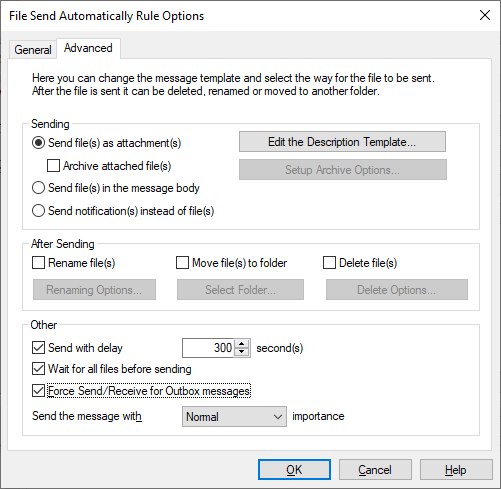 The “File Send Automatically” add-in is able to send email automatically, with no successive input required. After a single configuration process, all of your periodically updated documents will be sent in automatic emails, with the frequency and structure specified in the product’s wide range of custom parameters. 4) You can fine-tune your automatic email with options such as sending each updated file separately, or sending a previously-specified collection of files to be sent in automatic email as a pack. If the conditions regarding the file and the relationship with the clients remain unchanged, you will no longer have to ever be present at the machine to send these files. The only requirement to be able to auto send email in Outlook is for Outlook, which is used as a platform for the add-in, to be running at the time of the file modification, so that the sending action succeeds – such is the limitation of the MAPI protocol, which is designed to improve the Microsoft’s Office family but also to keep it safe and secure.